California students and their families deserve the best prepared teachers, and California teachers deserve to feel ready to meet student needs from their first very day in the classroom. The Foundation supports teacher preparation efforts across California to transition their work to the new Common Core and Next Generation Science Standards. The Foundation’s teacher preparation strategy is focused on partnerships between preparation programs and the districts who hire their graduates. Foundation grantees provide teacher candidates with rich, practice-based clinical and field experiences in partner schools that ensure teachers have many opportunities to master the key skills, knowledge, and dispositions they will need to be successful. Grantee preparation programs and district partners are also engaged in sharing data about teacher and student outcomes for the purpose of continuous improvement. The Foundation is proud to support the California State University’s New Generation of Educators Initiative. Inspired by the belief that all California students have the right to receive a high quality education and all California teachers have the right to be prepared to teach at the highest level every day, the New Generation of Educators Initiative aims to ensure that graduates of California State University (CSU) teacher preparation programs enter the classroom truly ready for the joys and demands of teaching. Through this and other initiatives, the CSU is leading the way in advancing the new Common Core and Next Generation Science Standards. As the largest preparer of teachers in the state, the CSU also has an unparalleled ability to bring innovation to scale. In recognition of the fact that teacher preparation happens throughout the system, the New Generation of Educators initiative is led by a working group of Arts and Sciences and Education faculty and Deans, and K–12 partners. This working group supports CSU teacher preparation programs to provide teacher candidates with coursework and clinical experiences designed to ensure that teachers master the skills they will need to start strong from their first day in the classroom. CSU leaders at the campus and system level are also engaged, alongside partners from K–12 districts, in data-driven decision making for continuous improvement, which will allow the CSU system to continue to refine its teacher preparation practices for years to come. Learn more at the CSU website. The Fresno United School District is the fourth largest school district in California, serving more than 73,000 students. Seeing potential to strengthen the grade 4–8 teacher pipeline, the district and the local state university, CSU Fresno, are working together to develop and implement a teacher residency program. 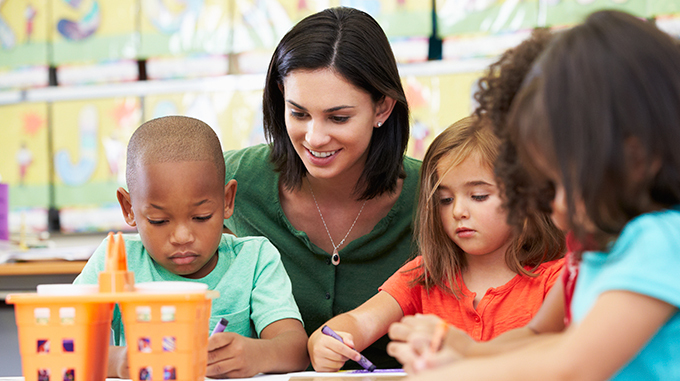 During a 13-month graduate program, future teachers undergo rigorous coursework and a yearlong teaching apprenticeship, resulting in both a teaching credential and a Master of Arts in Education. In exchange for having their Master’s credential program funded, graduates of the residency commit to teaching in the Fresno Unitied School District for a minimum of five years. This unique program blends educational coursework and classroom practice, better preparing teachers to meet students’ needs. Learn more at the Fresno USD website.